Bamboo dinnerware for the whole family Like us, you have probably found yourself exploring alternatives to the vast array of plastic dinnerware marketed to parents of young children. Our bamboo dinnerware is non-toxic and biodegradable, making it a healthier choice for the environment as well as for ourselves. Why bamboo? Bamboo is simply amazing! It is a highly versatile natural resource which provides an environmentally friendly solution to a broad range of uses; from scaffolding and house building to cloth diapering! As one of the worlds fastest growing plants, needing very little water and no pesticides to grow, it is a naturally resilient plant which is fully biodegradable. It is a remarkably “green” resource. Why Next Gen Bamboo? Family Friendly: As parents of young children ourselves, we have sought out the best aka healthiest, sturdiest, smoothest, most lightweight and “toughest” bamboo dinnerware available. Design Conscious & Kid tested: Our current product offering is available in soft, neutral colors in sky blue, stone grey and a soft natural ivory which are sure to complement any dining situation. Our final product designs are based on what has worked best for the little hands in our family by paying attention to details such as bowl size and shape and suitably raised sides on our kids plate to assist in picking up food easily. Easy to Clean: We have chosen a super smooth finish for our bamboo dinnerware ensuring an easy to clean surface. Our dinnerware is also dishwasher safe. Coordinating Product Line: Say goodbye to bright plastic kids plates! We currently have a range of products available including dinner plates, kids sized dinner plates, flat bowls, kids/snack bowls and cups. All items are available in sky blue, stone grey and natural ivory allowing you to coordinate your kids dishes with your own. We will also be adding to our product line in coming months so stay tuned! 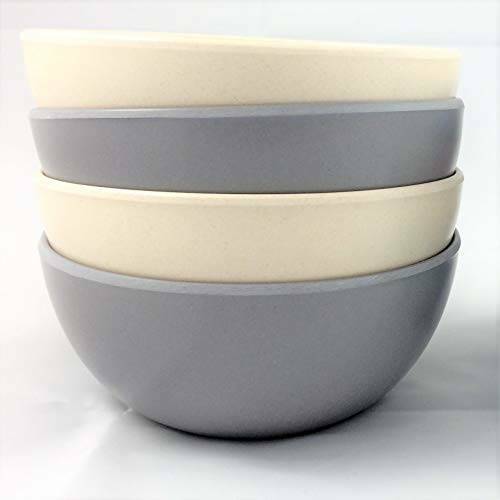 – SUITABLE FOR ALL: Measuring 4 inches wide & weighing 54g, these light weight, sturdy & break resistant bowls make them suitable for everyone. When filled to the top, they hold a cup of food making them especially useful for baby dinners in those first few months of weaning. Available in a variety of colors, sky blue, stone grey, natural ivory, a combination of natural and sky blue or a combination of natural and stone grey, these bowls are sure to complement both indoor and outdoor dining. – EASY TO CLEAN: We have made it our mission to provide only the smoothest of bamboo dinnerware. You have possibly tried bamboo dinnerware before and found it to be grainy in texture but not this time! These Bamboo bowls have a super smooth finish making them very easy to clean. The are also dishwasher safe, top rack recommended. They are not suitable for oven or microwave use. – ECO FRIENDLY & HEALTHIER FOR ALL: Made from renewable and sustainable bamboo fiber, this dinnerware is a healthier choice for your family and the environment. BPA and phthalates free, toxic free and CE, FDA and SGS approved. – COMPLEMENTS OUR NEXT GEN BAMBOO PRODUCT RANGE: We have a product range designed for all members of your family. Say goodbye to the bright plastic kids plates and cups and welcome a healthier, bamboo fiber dinnerware range into your kitchen. – MONEY BACK GUARANTEE: We have no doubt that you will be satisfied with your new dinnerware range, just as we are. However, if for any reason you decide this is not for you, you are welcome to return your purchase within 30 days for a full refund.